Fishin' Impossible slot is a rather oddly-themed game where robotic fish are caught via a futuristic control room which you will enter upon opening the game up. You are greeted by a frantic rocking music beat with intermittent roars and sounds and the reel symbols are all joined by lengths of fishing line to complete the effect. Like Netent's Evolution slot you have transparent reels behind which various creatures swim past and they really do look strange and very dangerous, but will Fishin' Impossible provide a rich catch for you, or ultimately reel-in your balance? We see 40 pay lines over 5 reels of 4 rows each with the symbols stacked and the fish themselves occupying 2, 3 or even 4 rows depending on their type, while the card values do the same but Wilds only appear singly. Your 5-of-a-kind pays are 25x your 40-coin stake for the Shark, 15x Robot Fish, 10x Blue Fish, 5x Pink Fish, 3x Green Fish and finally 2x for the small White Fish. The four card values pay 70, 60, 50 or 40 coins from Ace down to Jack. Wilds on their own pay the same as the highest symbol and do not multiply wins. On any spin you have a random feature which may award a 'recast' if you lose which will always be a winning re-spin. You have 2 interesting bonus games to net here too, both triggered by a bonus scatter on reels 1 and 3 with either the free spins or Go Fishin' one landing on reel 5. 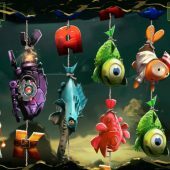 There are actually four missions in this bonus, and after each one you get a star added to the counter on the left of the reels for each fish caught, and every 10 collected unlock the next and potentially higher-paying level, similar to unlocking levels on games like Immortal Romance or Thunderstruck 2. There are 10 fish available on your mission, and you pick from 3 spots to cast your line. Each spot will randomly remove 5 of the fish which are scaled in value from 1 to 10, hopefully the lower ones as the highest is 250x bet! You then wiggle your bait and see which fish bites - if it's the highest you have available you can collect it, if not you get 2 chances to return it and try again. As you progress through your bait becomes more attractive and the fish values increase too, so therefore the potential returns from this weird bonus - Alaskan Fishing it certainly isn't! Free Spins - a simple round which cannot be retriggered as the centre reel becomes a sticky stacked Wild and you get 5 free spins with this in place. If you need a chance for the top pay of 1000x bet for a full screen of Sharks, it'll be more likely now.